Happy Wednesday! I’m linking up with Annmarie from The Fit Foodie Mama, Jen from Pretty Little Grub, Michelle at Fruition Fitness and Nicole from Nicole from FitFul Focus for Wild Workout Wednesday. This is my third installment for “Blogs I Love”. You can read part 1 and 2 here and here. I’m always on the look out for new blogs to follow. I feel like I’m always learning, especially when it comes to running, so I love reading about running through different viewpoints. Through blogs I’m always able to learn about new products to try, books to read and races to run. Here are a few more of my faves. Erica is an avid runner and she lives in Chicago, IL. I like to call her the marathon guru considering she has completed tons of marathons, including running the NYC Marathon 17 times!!! She’s also pretty fast and has won numerous age group awards. I have found out about SO many great running items through her blog. Her products reviews are always honest and informative. Also I’ve been lucky enough to meet Erica in person and she is such a sweetheart! Nicole is a runner and fitness lover that lives in Austin, TX. I was lucky enough to meet Nicole in person a few times when she lived in New York and she is such a nice person with a very warm personality. What I love about her blog is that she focuses on a wide array of topics such as running, fitness classes, fashion, food and recipes. I feel like I can always learn something new when I visit her blog, especially when it comes to food. I have printed off so many recipes from her website! Jess is a runner and she lives in, you guessed it, Atlanta, GA! I really connected with Jess this year as I was training for the NYC Marathon. She was also training for a marathon around the same time and she was super supportive. She produces quality blog posts every week and they are a joy to read. In addition, she has also suffered from and IT band injury, so I’ve learned some different ways to keep that injury at bay through her blog. Chelsea is a runner and she lives in Pittsburgh, PA. I’ve been reading her blog for a few years and she really inspires me! She has a crazy busy schedule, but she is able to travel to different states all around the country to run both half and full marathons. I often enjoy following her journey on Instagram/Twitter but she also provides really solid, honest race recaps on her blog. 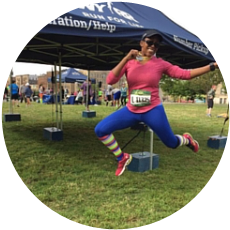 If you’re thinking of doing a race, make sure to check out her blog for all the details! Jen is a registered dietitian and runner and she lives in Canada. I’ve been a reader of her blog for about two years and I always learn something new. I love her blog because she keeps it real 100%. She had a great mix of running, nutrition and personal posts. I also love reading about her travel adventures! Do you have a favorite blog that you visit daily? Let me know in the comments. I’m always looking for new blogs! No problem. I think you’ll enjoy both of their blogs! Thanks so much for the shout out. I really, really appreciate it. And there are a few on this list I haven’t seen before so I’m excited to check out their blogs. No problem Jen! I hope you find new blogs to follow as well. Great picks! I’m very familiar with Jen and Nicole and recently started reading Jess’s blog. I’ve got some new blogs to follow now, thanks! No problem! I’m all about spreading the blogging love. So many good blogs out there!! I love all of these. Heading back to read parts 1 and 2! Thanks Wendy! I agree that there are so many great blogs out there and I always like finding new ones! Thanks for a list of great blogs, I’m off to check out some of the new to me ones. That’s awesome! Thanks for stopping by my blog Ange! Fun blogs! I love all of them! 🙂 Thank you for sharing your faves! No problem – Hope you found some new ones to follow! Thanks so much! I always stumble upon new blogs through other bloggers and social media, it’s the best! Aw shucks! Thank you, Kimberly! I appreciate the shout out and support and love being your marathon guru!! I hope to see you again at the NYC or Brooklyn Half as I’ve signed up for both! Excited to check out a few new blogs, too! No problem at all – you know how much I love your blog! I’m planning on signing up for the Brooklyn Half again this year so I hope to see you there! Some awesome bloggers here! Nice roundup! These are some of my favorites, too! Thanks so much for sharing! There are a few new faces in there that I will have to check out! Happy to share and I’m glad you found a few new blogs to follow! I love all of these blogs! Great choices! I follow two of the blogs listed here, but now I have three more to add to my reading list! Hurray! That’s awesome! I’m glad you could find some new blogs to follow! great picks! There are a couple news ones for me to check out- thanks! Thanks for the new blog suggestion! These are great blogs, it’s great of you to share your favorites! Thank Toni! I hope you found some new blogs to follow! I really love finding new blogs to read! I love this round-up of blogs! A lot of them are new to me, so I am eager to check them out! That’s great! Glad I could provide some new blogs for you to check out! Yay for Erica, Jen + Nicole! The other two are new to me, so I’m going to have to check those out! :D!